When Aparna of My Diverse Kitchen suggested we bake pizzas for the ‘We knead to bake September challenge’, I thought yum… the options can be endless. The base and/or topping had to be different from the ones we make usually. I read the posting during my trip to Italy. Everywhere from then I was looking out for a different type of pizza. Unfortunately, didn’t find any except when we stayed in a hotel in Baveno. They served a fruit pizza for breakfast. The fruit was beautifully arranged on the base. That gave me an idea… I would bake a fruit pizza. As other fellow bloggers posted their baked pizzas, most of them were savoury ones so my decision to concentrate on a fruit one became more solid. Initially I wanted to bake a banana chocolate pizza, but the idea of baked banana didn’t sound too appealing. The next best bet was apples. Recipe ready, ingredients ready but I didn’t get time to bake it till today! No power, busy at home, busy with Lionism, busy with community work etc etc. As the saying goes, everything happens at a certain time for a reason. The reason the chance to bake it came today was because today is Nunu’s birthday. Though she is in Mumbai, hubby and I got to have a sweet treat. Coming to Baveno, its a small quaint town with beautiful villas on the shores of Lake Maggiore. Milanese come to stay at Baveno for a weekend getaway or during the summer holidays.With gentle sloping hills as the back drop and a blue expanse of water as the front yard, Baveno is a romantic town. It also has a beautiful view of the Borromeo Islands in front. From Baveno we visited the fishermen’s island or Isola dei Pescatori as its known to Italians.They have a regular ferry and boat service to the island. Its the only island inhabited by people. The other islands are open to visitors during the day but no one lives there at night. Getting back to the recipe, I decided to use my apple crumble recipe to top the pizza base instead of just putting slices of freshly cut apples and decorating with cream. Put flour in a bowl. Mix in the sugar, salt and yeast. Rub oil into the flour. Using warm water form a soft dough. Lightly flour the work top and knead the dough for 5 minutes till it is smooth and soft. Place the dough in a greased bowl. Cover with a cling film and let the dough rise till its double the size. This will take about an hour. Put them in a pan along with the butter and sugar. Cook the mixture over medium heat till the apples are done and the sauce is slightly thick. Add the cinnamon powder and mix well. Leave the mixture on the side till required. Place the flour and sugar in a bowl. Add the butter and lightly rub it into the flour mixture. Gently knock down the risen dough using your knuckles. Grease a baking sheet lightly with oil. Take one part of the dough and roll it into a circle of 3 inches. Place it on the baking tray. Roll circles with the remaining dough. Let the rolled base rest for ten minutes. In the meantime preheat the oven to 200°C. Prick the base in a few places with a fork. Place it in the oven and bake for 5 minutes. Put the apple topping on each base. Top it with the crumble. Bake the pizzas for 10 more minutes or till the edges are golden brown. Remove the pizzas from the oven and let them cool slightly on a wire rack. Mix powdered sugar and milk to form a smooth glace icing. Drizzle it over the pizzas. Garnish with chopped roasted mixed nuts and serve. You can use banana instead of apples. If using bananas no need to precook them. Mix sugar and butter with the bananas and top the bases. You can replace the apples with pears. Serve the dessert pizza on its own or with some fresh whipped cream or vanilla ice cream. Wow fruit pizza, a kids friendly pizza definitely. 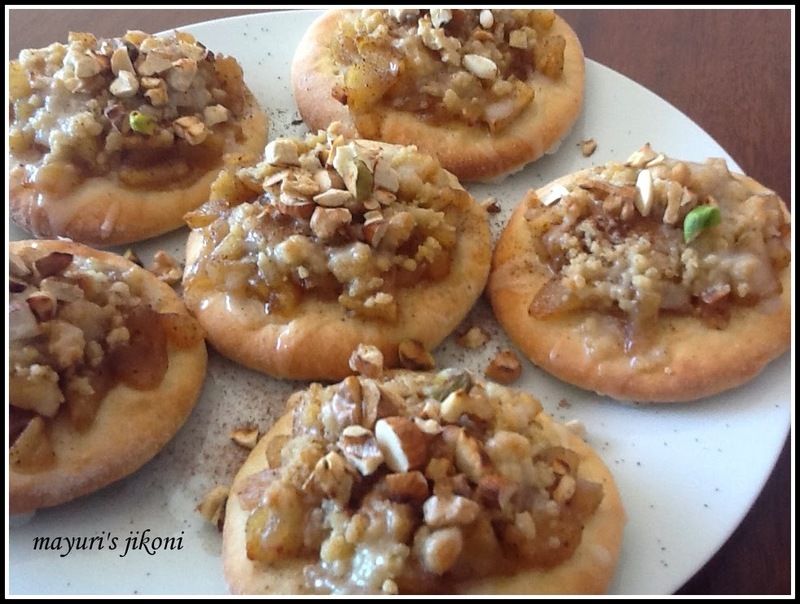 delicious way to eat apples , love this.